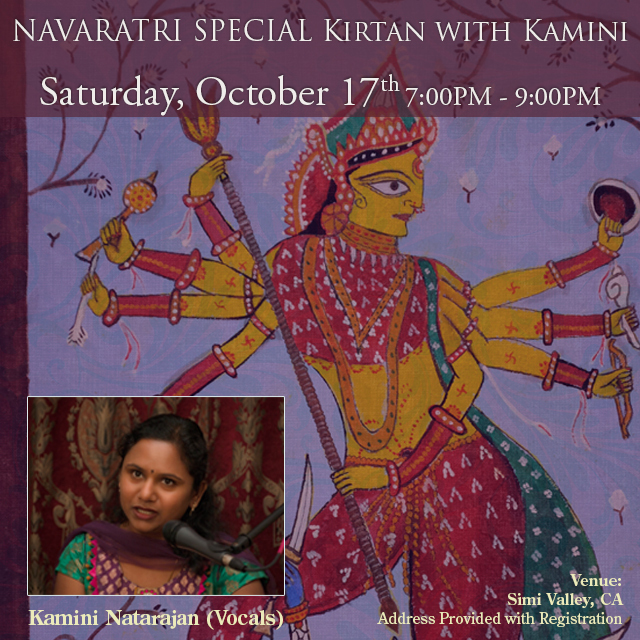 I would like to invite you all to a VERY SPECIAL Navaratri Kirtan ! Navaratri is a special 9 days of worship and dance. The word Navaratri literally means nine nights in Sanskrit; Nava meaning Nine and Ratri meaning nights. During these nine nights and ten days, nine forms of shakti/Devi i.e. female divinity are worshipped. Goddess Durga is also worshipped under nine different names for the nine days in Navaratri. Every day, she assumes a new character, a new look and a new duty. These nine forms of manifestation are Shailaputri, Brahmachartini, Chandraghanta, Kushmanda, Skandamaata, Kaatyayani, Kaalratri, Mahagauri and Siddhidaatri. We will start with a pot-luck Vegan light dinner and follow with chanting and singing Kirtans! Please bring your chants, Kirtans, Music, Musical Instruments ! Open to all with Donations. Suggested Donation $10.